I must admit that I am a bit surprised by the number of page views for the “Oracle SQL Recipes: A Problem – Solution Approach” book review that I posted 4 days ago. That article is currently in 12th place for the number of page views on this blog in the last 90 days, and currently has half as many page views as the blog article in first place for the last 90 days (there are currently 202 blog articles on this blog). You may have noticed that, unlike my other blog articles, I do not permit readers to post comments on blog articles that are book reviews. I personally pay for each book that I review, and I try to post reviews of books with that criteria in mind – am I getting my money’s worth from the book, and what do I think about the book’s contents. Why isn’t my index being used. Is there any certain way to know if it is safe to drop an index (monitoring is not sufficient). Rebuilding indexes and Metalink notes. I ordered the second book because I had previously purchased two copies of the 9i/10g edition of this book, and I purchased his “Expert One On One” book. I ordered the third book because I had previously purchased that author’s “Forecasting Oracle Performance” book. 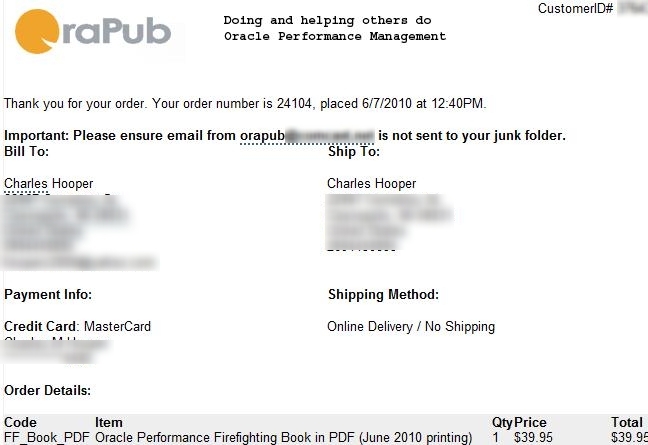 The “Oracle Performance Firefighting” book (fourth printing) arrived by email on Tuesday. I am a bit disappointed that I cannot print the PDF file, nor copy sections of the PDF file – something that is permitted in the PDF copy of the “Expert Oracle Practices” book that I bought from Apress. I am also a bit surprised that my name, address, and phone number appear at the top of every page of the “Oracle Performance Firefighting” book, but I understand why. I am roughly 20 pages into the book, but it has not yet latched onto my undivided attention as has happened with some of the other books. I plan to post detailed reviews of these three book, just as I did with the “Oracle SQL Recipes” book. That is exactly what you are doing by posting the original works of others with just a couple of changed words. Kind of odd that I would post that message, or maybe not. For the record, it was not my material that was copied without attribution. * I will not be able to tell if I am getting my money’s worth from the book if I receive the book for free, so I might have difficulty assembling a review that is as in-depth as my other reviews. * I could write a 4 page review on the first 27 pages of the first edition of the book (based on a Google preview of the first edition), even with the larger than typical font size that seems to appear in some books. I ordered the second edition of the book, hoping that many of the issues that have been mentioned to the author regarding the first edition of the book are corrected. I certainly hope that I do not see waits on the CPU in the second edition of the book – I mentioned this to the author in an OTN thread in October 2009 (thread is linked in my book recommendations article). * I want to see a comprehensive book that gives me all of the knowledge that I need to troubleshoot any system – if it reads like a 1,000 page true or false test I will be disappointed. * It will be interesting to see which of the two books still on order ships first.